Sam Hedrick (center) on the Emerging Issue Forum panels discussing health care and the economy. 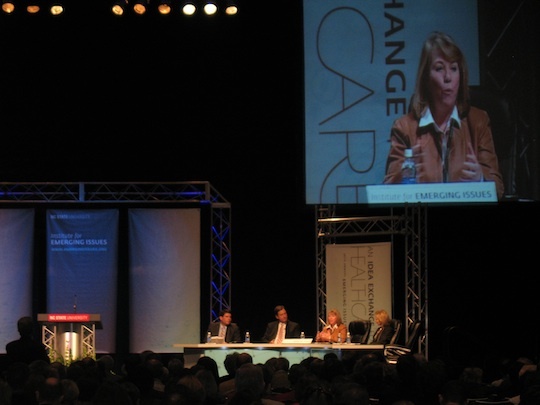 president and of RHA Howell, Inc., served as a member of a panel discussion on healthcare and the economy during the “Emerging Issues Forum: An Idea Exchange” held February 7 and 8 at the Raleigh Convention Center in downtown Raleigh, NC. RHA Howell is a state wide, not-for-profit 501 (c) (3) organization that has been serving people with disabilities and special needs for nearly 40 years. As president of RHA Howell and as Senior Executive Vice President of RHA Management Company, Sam Hedrick has to address the company’s pressing financial challenges due to uncertain government funding in an environment of rising healthcare costs. Joining Hendrick on the panel were: moderator Chris Williams of Carolina Business Review; Lanier Cansler, Secretary, NC Department of Health and Human Services; Carol Lovin, President, Carolinas Healthcare System Management Company; and Brian Denton, Associate Professor, Edward P. Fitts Department of Industrial & Systems Engineering, NC State University. Among other notable attendees at this year’s Forum were Indra Nooyi, Chairman and CEO of PepsiCo, CNN’s Chief Medical Correspondent Sanjay Gupta, and Risa Lavizzo-Mourey, President and CEO of the Robert Wood Johnson Foundation. The annual Emerging Issues Forum is hosted by the Institute for Emerging Issues, an initiative through North Carolina State University that “brings people together around complex issues in pursuit of a single goal: to ensure North Carolina’s future competitiveness.” For more information visit www.ncsu.edu/iei/. RHA Howell is a not-for-profit 501 (c) (3) organization that has been helping people with disabilities and special needs, and their families, make choices to live more independently for nearly 40 years. Integrity, high standards for quality, and hard work are at the core of every RHA Howell program. RHA Howell is a pioneering force in the field of human services for children and adults across North Carolina with the mission “Opening the world for people with disabilities and in turn, enriching the lives of everyone they touch.” For more information, go to www.rhahowell.org.